I would like to help you out. Which way did you come in? life should be as balanced as your favorite album. 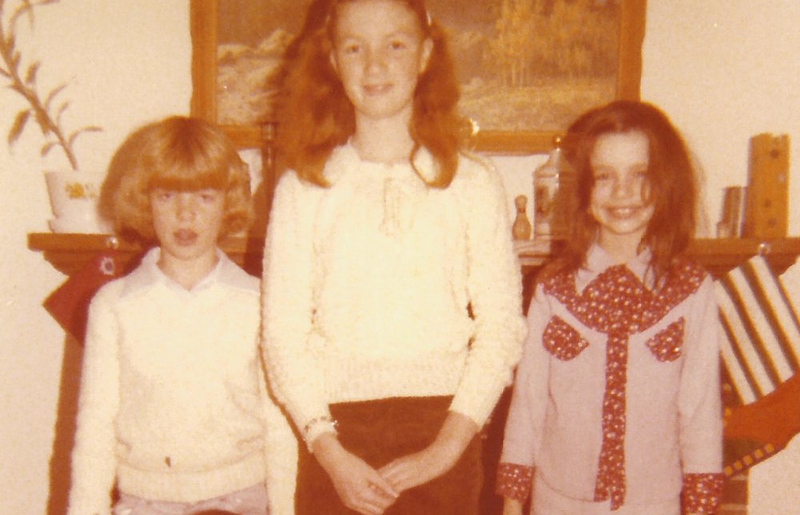 That’s me on the right with the terrible hair and Chrissy in the middle. Amazing what six months of growing can do in terms of height. Hey, how are you? It’s been awhile, huh? I just amused myself by looking back at last years’ SINGLE post and realized that here I am a year later, at almost exactly the same time and writing the first post of 2015. The good news is that life continues on, more or less the same. Which means that we’re all still here and we’re all OK, and sometimes that has to be good enough. And there’s no one who can help you remember that quite like your first cousin. My cousin Chrissy (even at this age it seems completely foreign to refer to her as Chris, like everyone else does) was the first cousin I met after arriving on this big blue marble. Settled outside of Baltimore, Chrissy and I were born six months apart, but we might as well have been living six planets away. Growing up I would see her (and eventually her sister and brother) twice a year, at Christmas and in the summers when they would pack up their grey Chevrolet Citation and drive the fifteen hours from Catonsville to Rolling Meadows and eventually Algonquin. In terms of time spent together, the actual total of days must equal less than six months, but in terms of impact on my life, the memories and connection I have with Chrissy is immeasurable. I was reminded of this during my recent visit to Baltimore (for work) when I had the chance to stay with Chrissy and her family in Sykesville. We spent many hours first at the kitchen table and then on the comfy overstuffed couches in her basement catching up, reliving old times and re-establishing our connection. There was the trip to Ocean City and the one in the Adirondacks too. There were family weddings and reunions from days gone by. There was the inevitable comparison to our younger cousins, and of course there was much conversation about our shared roles as the eldest daughter. Having lost her father, Roger, at the age of twenty-two and the loss of my mother at the age of forty, we not only share the responsibilities of being the firstborn, we also share the sense of loss that only comes from prematurely losing a parent. We both have a keen sense of the importance of family, but also share the frustrations that come with such priorities – dealing with perceived disappointments of siblings, the continual perceptions of “having it easy/the perfect family”, or just having to be the perpetual rock through a myriad of family dramas. There’s nothing like being able to have an open and supportive dialogue with someone who’s in the exact same boat you are – paddling along, desperately trying to keep things steady and moving ahead, despite the sometimes turbulent waters you encounter. It was incredibly reassuring. And familiar. And in discussing all of the events that have happened as the years have passed by, one thing became extremely clear to me: though you may be miles and miles away and your time spent apart significantly outnumbers the days spent together, there simply is no substitute for the love and shared history of your first cousin. This entry was posted in Life Lessons, Nostalgia. Bookmark the permalink. Join us on our first trip together to Ireland. "Sometimes you just gotta say, 'What the ... '"